Political showdown in Islamabad, capital of Pakistan, has reached its boiling point. Police attacked the peaceful protestors of two political parties without any provocation. The course of events that followed, from last night onwards, have exposed the brutality of the government of Prime Minister Nawaz Sharif. The protestors belonged from Pakistan Tehreek-e-Insaf (PTI) and Pakistan Awami Tehreek (PAT). Last general elections held in Pakistan in May last year were massively rigged. There is plenty of circumstantial evidence available to prove the rigging claims. PTI was protesting against election riggings. PAT wanted to overhaul the corrupt democratic structure of Pakistan. On 17th June this year, the headquarters of PAT were raided by Punjab police and 14 people were killed in broad daylight. PAT was therefore protesting for overhauling the system as well as demanding justice for its slain activists. 14thAugust, the independence day of Pakistan, was the day when the protest marches of both parties left Lahore for Islamabad. They reached Islamabad late night on 15th August. Since then both parties organized peaceful sit-ins in Islamabad. Last night both PTI and PAT announced to move the sit-ins outside Prime Minister House. As the protestors were peacefully moving towards their destination, the Police attacked them without any provocation by protestors. Police attacked the protestors with tear gas shells, most of them were expired, rubber bullets and in some cases steel bullets. As I write these lines, the police brutality is continued unabated. Over 400 people including policemen have been injured as a result of the clash between protestors, numbered in tens of thousands, with Police. 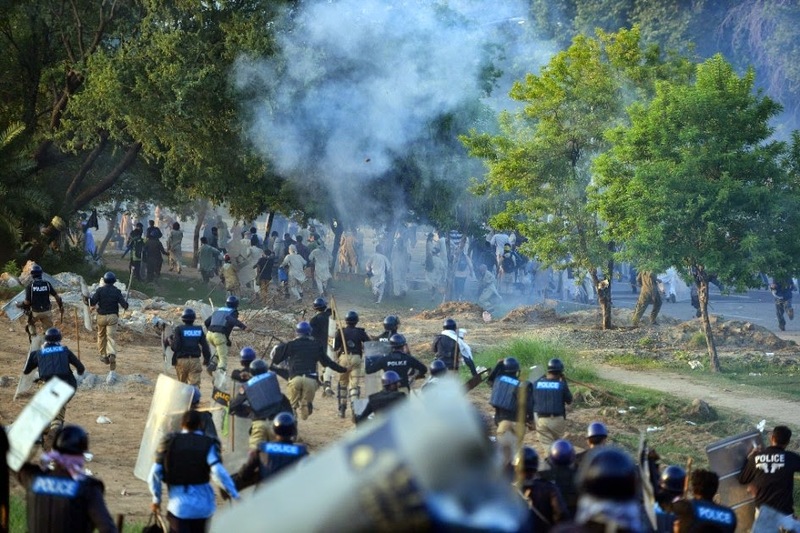 The social media teams of PTI and PAT have dubbed the police brutality as #IslamabadMassacre. According to official claims, only three protesters have died so far. However, according to the claims of PAT up to 10 of their activists have died as a result of Police brutality. The government claims that protestors wanted to enter the president house and that’s why the police reacted and the clash erupted. The accounts of media persons and other credible sources refute this claim. According to an analysts, Wajahat S. Khan, who quoted the Army officials, said that protestors were peaceful and they didn’t provoke police in any way. Accounts of many other media personnel corroborate the claims made by Wajahat S. Khan. The worst part about the entire episode is the attack on media personnel by Police. Police attacked the DSNG vans of at least 7 news channels; ARY News, dawn News, Aaj Tv, Jaag Tv, express news, Dunya News and Samaa News. Police dragged the staff of these channels from the DSNG vans and brutally tortured them. According to the media persons, the attack was carried out to force the media to stop live coverage of police brutality against protestors of PAT and PTI. It’s interesting to share that the correspondents of Pakistan’s largest private news channel GEO news were not attacked. The reason being, that GEO News is reporting in favor of government in complete contravention of all journalistic norms. In order to justify attack on media teams, Federal Minister Ahsan Iqbal claimed that Police had information that protestors were hiding in DSNG vans of news channels. Another Federal Minister Khawja Saad Rafique, claimed that attack on media by Police was a conspiracy against Government. It’s obvious that government is doing damage control after the police brutality against journalists was caught on tape and telecasted in the entire world. Prime Minister is conveniently watching the entire show from his Palace in Raiwand, far away from the capital. The government has entirely failed in dealing with the peaceful protestors whose cause was justified but one can question their methods. Let’s not forget that both PTI and PAT are political parties and they will play up the emotions for their political advantage. Notwithstanding that fact, the police brutality against the peaceful protestors is unacceptable and condemnable in strongest possible terms. The showdown in capital of Pakistan has exposed many faces. Asma Jehangir, a respected Human rights activist, was vigorously defending the police tactics adopted against the protestors of PAT and PTI. Certain other liberal and progressive activists and media persons were seen defending the police brutality in the name of defending the democracy. Prime Minister has spread the disinformation that Army is behind the protests of PTI and PAT and many people have bought in the propaganda. What’s happening right now in Islamabad is a black chapter in history of Pakistan.